The electric power plant, built in 1887, made Stockton one of the first towns in western Kansas and one of the smallest towns in the nation to have electricity. It began as a private business and then sold to the city in 1889. The building was made of locally manufactured brick. 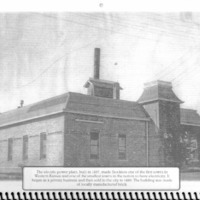 “Electric Power Plant,” Recollections Kansas, accessed April 21, 2019, http://recollectionsks.org/items/show/1797.